Escena Golf Club. Golf Escena Palm Springs. Escena golf course details and information about Escena Golf Club in Palm Springs, California. Escena Golf Club is a public championship golf course. It features beautiful views of the San Jacinto Mountains from every tee. The stunning features include desert landscapes, lots of palm trees, and still lakes. It has strategically placed bunkers and water hazards to test the skills of every player that attempts it. Golf Escena Palm Springs for an award winning experience. It is ranked #6 Public Golf Course in California by PGATour.com. So the beautifully unobstructed views are not the only reason to try the course. In addition to Escena golf, there is also an Escena Grill to fill you up after a long day. 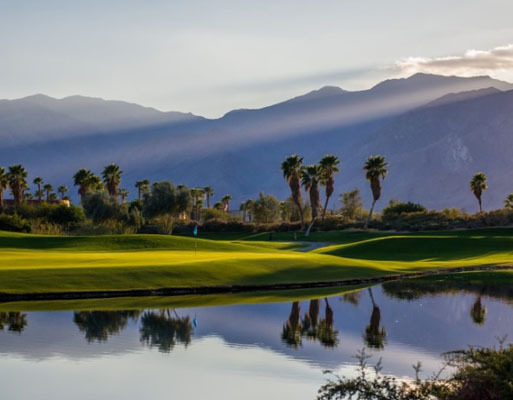 For details on a public golf course nearby in Palm Desert, check out Palm Desert Country Club.